I ended up volunteering at an elementary school on a day almost two weeks ago, and while I was there, I decided to eat lunch just to see what was available to kids in the Denver metro area, as opposed to wherever Mrs. Q is located. 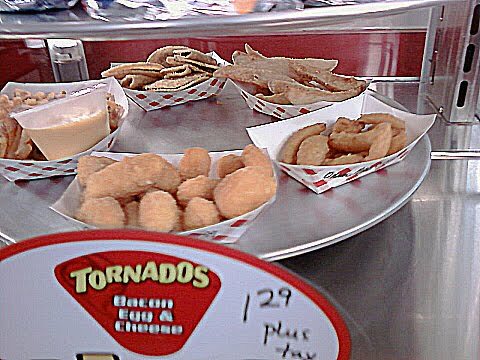 I love that I probably wouldn’t have thought of eating at the school cafeteria except Mrs. Q totally inspired me to be on the lookout for what kids are eating these days! The choices were chicken nuggets or a turkey and cheese sandwich. I chose to order the chicken nuggets because that’s what most of the kids in my class were ordering. The chicken nuggets came with about a cup of (what I think was canned) corn and green beans, a whole grain roll, tater tots, and milk. Then, you can get whatever you want off of the “salad bar” (which isn’t really a salad bar at all, but just where all the fruits and veggies reside). The “salad bar” offered up canned peaches, whole raw apples, raw carrot sticks, and pasta salad (which looked to be little more than cooked pasta in vinaigrette, no extra veggies). The chicken nuggets were a little bland in my opinion, and the corn/green beans were downright gross – they tasted like the inside of an aluminum can… very salty. And even the apple was extremely under-ripe, almost bitter. While it was clear that the right intentions were there (good intentions being to feed children more nutritious food), I think the execution left something to be desired. 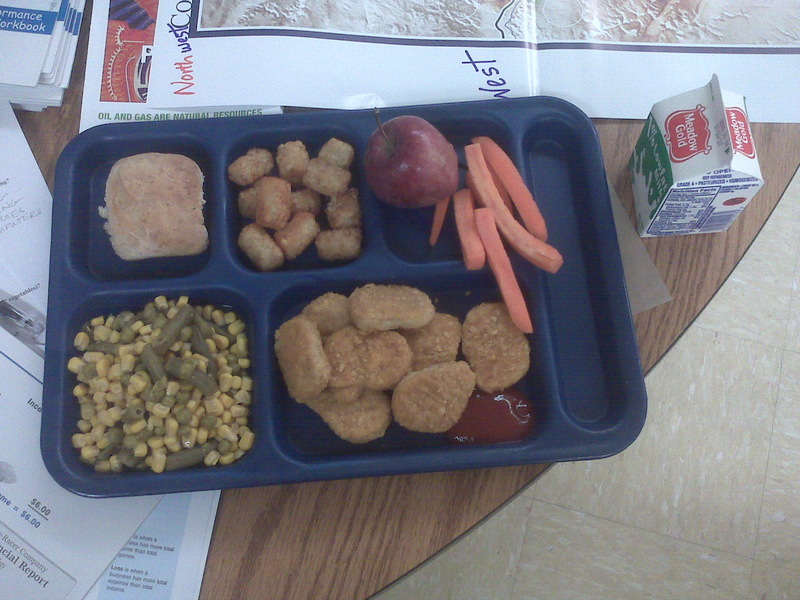 I can imagine that the kids wouldn’t want to eat much more than the nuggets, which is what I saw a lot of them doing. The placement of the salad bar as compared to what the kids get on their plate had me wondering, too. Why would you give kids all the starchy stuff, and then let them choose to eat vegetables or not? Of course they’re going to bypass the salad bar, if given the choice. I feel like you should give the kids a protein and then a bunch of fruits and veggies, then let them choose to add tater tots or rolls to their meal. I guess, however, that I see how they might add a ton of tater tots instead of eating only the 10 they are given on their plate. But I know there must be an answer to that problem! Also something to note – the lunch I ate was $2.80 for kids to buy, but most of the kids at the school I was at are on 80% subsidized or free lunch programs. 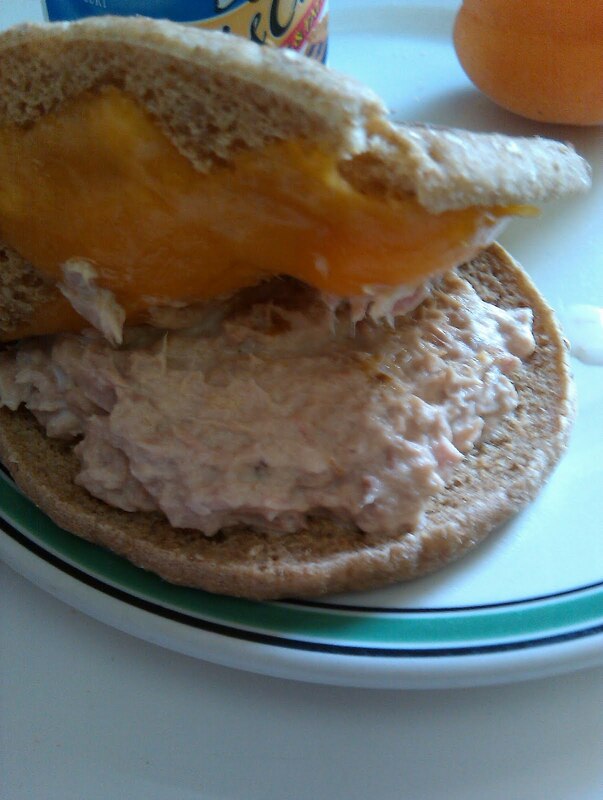 Thanks to everyone who commented on Pimp my lunch: tuna melt. Your feedback was *amazing* — I can’t thank you enough. There is much for me to learn about eating better in general. Please know that I am learning new things right along with you too. I submit to you my lunch today (Monday). On the last lunch post, some of you questioned my “thin” bread so I wanted to show you the brand “EarthGrains” (no HFCS – high fructose corn syrup). My husband bought it unprompted by me (!). The cheese is the store brand that I’m trying to use up. 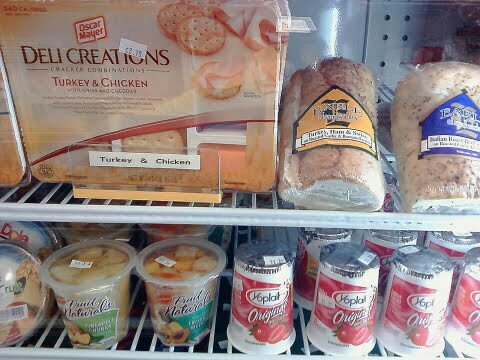 The brand of the deli turkey is “PrimoTaglio” — there were no nitrates in it. BUT those two slices contained 510 mg of sodium (21% of my daily requirement — as much as any microwave meal)!!! I’m floored. What do you eat in your sandwiches? I could have jazzed up the sandwich with a slice of tomato… By the way did I tell you I only started eating tomatoes when I was 25? I disliked them, but I started eating them to increase my daily veggie by one. Truly though I do have to “hide” them in a sandwich to eat them. Or I will eat them with fresh mozzarella, but that is a special treat. The Yoplait I ate last time did have HFCS in it — I shouldn’t have been surprised since I didn’t read the label. I’m done with Yoplait now that I know that. Instead I bought greek yogurt based on your suggestions (even though I have had it before and I’m not a fan). I have to force it down because of the thick, extra clumpy texture. I wanted to drizzle honey on it, but I couldn’t find my honey in the cupboard or in the fridge door! I know I have some…it’s just a matter of finding it. Where do you store your honey? The salad is in a deep bowl (I’m not sure you can tell from the shot). 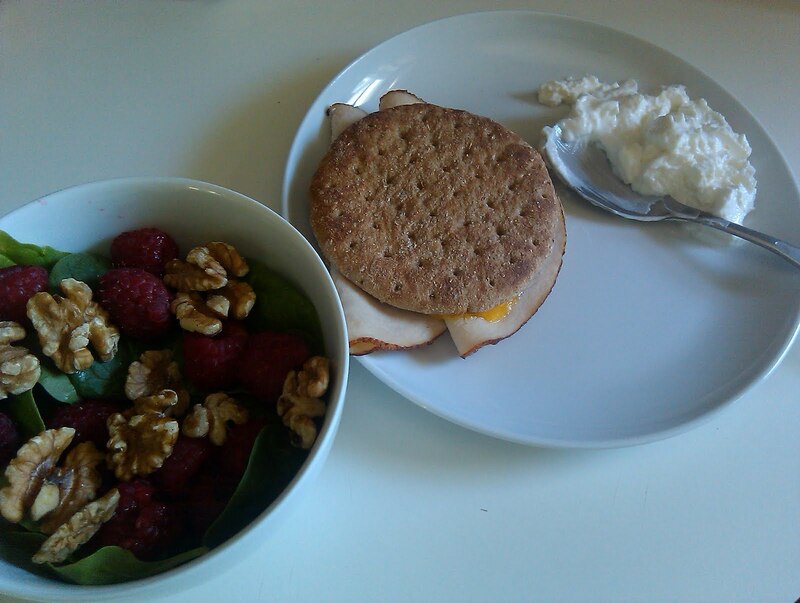 I sprinkled raspberries (organic) and walnuts on the spinach leaves (like I said before I’m not a fan of plain lettuce). I bought new poppyseed dressing (we have some vinagrettes in the fridge – eh) and it was tasty (I’ve had the Brianna’s brand before – good stuff). I enjoyed every mouthful of today’s salad. And I made the salad again for dinner. I know this lunch is better than my “tuna melt” meal. Today I felt full until around 4 pm, which is longer than any of the school lunches I ate during the school year. On the other hand, demands at home are less than working at school so it’s possible I didn’t burn as many calories. I welcome your thoughts and feedback on what I ate for lunch! “Pimp my lunch” is going to be a regular feature this summer. If you would like to participate by posting your lunch and having readers critique your midday meal, fill out the little linky form below. Make sure to post the link to your actual blog post. I’m looking forward to seeing what you are making at home (and giving you feedback if I can think of anything to improve). I can understand being fed up with school lunch – and I can also understand being an angry mom. In fact, my concerns about my children’s school lunches 20 years ago are what initially drove me to become active in creating healthy school environments. My name is Dayle Hayes. As a Registered Dietitian and a member of the American Dietetic Association, I currently serve as Chair of the School Nutrition Services Dietetic Practice Group and Member Champion for the Prevention of Childhood Obesity. I live in Billings, Montana, where I am Co-Chair of Billings Action for Healthy Kids and president of Nutrition for the Future, Inc. While I am lucky enough to live in Big Sky country, I consult and speak across the USA with agencies and groups who are committed to enhancing the quality of nutrition for future generations. On my Nutrition for the Future blog, I make it crystal clear that I am not defending poorly performing school meal programs. If they haven’t taken advantage of what’s available from their state offices, Team Nutrition, or Action for Healthy Kids, they are on their own as far as I’m concerned. What I can tell you is that child nutrition programs in every state are doing amazing things with school lunch – and with breakfast in the classroom, second chance breakfast, recess before lunch, fresh fruit and vegetable snacks, healthy vending, farm-to-school, school gardens, and nutrition education. And, you don’t have to take my word for it, you can see the photographic evidence and read the delicious descriptions on the School Meals That Rock Facebook page. It’s essential to remember that school nutrition programs are making these nutritious, delicious things happen against all odds. 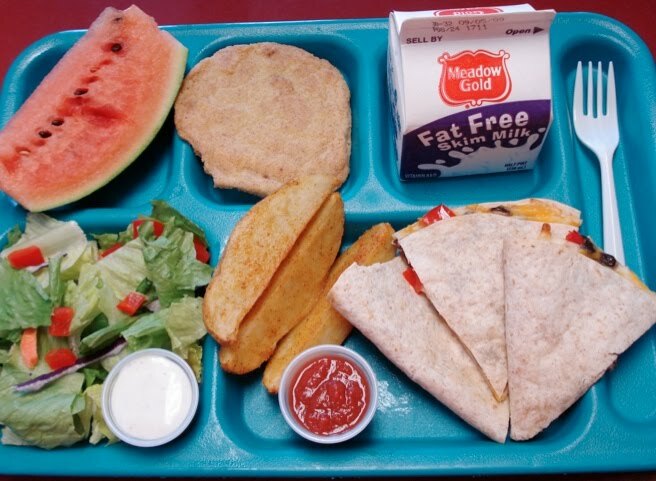 School meal programs have limited funding from USDA (try producing breakfasts and lunches that meet the Dietary Guidelines for Americans at around $1.50 and $2.70 respectively) and usually little or no monies from their local district. Cafeterias often have minimal support from administrators and school boards, who just want children to move through quickly and silently, so they can get back to the classroom. And, especially recently, school lunch ladies (and gentlemen) have been getting bashed everywhere they turn – from prime time TV to the Department of Defense. Bottom line: School nutrition programs can do awesome things; they can – and do – serve plenty of beautifully bright, locally fresh, incredibly tasty breakfasts and lunches. As I say in all my school wellness presentations, where there is a will, there is a way. Implement your school wellness policy. Every school is required to have one. Make sure that yours is up-to-date and being used (rather than collecting dust on a shelf). Join (or start) a school health advisory council (SHAC). Some states mandate them; every school can use one. American Cancer Society has a useful SHAC guide. Support a HealthierUS School Challenge Award application. Schools get great recognition and $500 to $2000 incentive awards. Enroll your school in Fuel Up To Play 60. This free program puts kids in charge of developing ways to enhance nutrition and activity at school. Please feel free to contact me if I can assist your efforts in any way. American’s children need all of us working together to insure their healthy future. Titanium Spork Award – Please vote! I just opened up the poll for June (running a tad late) so please vote when you the chance. There were only four nominees this time around so it won’t take you long to cast your vote! Fantastic speech! Thanks so much for your hard work and dedication to kids. This blog is dedicated to everyone who works to make kids’ lives healthier at school and at home! What kids drink at school is just about as important as what they eat. 1) Milk – I don’t drink milk anymore myself. But I support milk for kids when it’s hormone-free (which I don’t think it is in my district). Among the readers there seems to be a bunch of folks who prefer full-fat and those that don’t. Personally I support full fat. The reason is that it appears that eating fat doesn’t make you fat. Additionally, it’s a good source of fat (better than trans fat) and there doesn’t seem to be enough good fat in the school lunches I eat. See my previous post on milk for ingredients. 2) Water – Regular fountain access (water of dubious quality) and bottles sent from home (or bought in high school). I will post about school water next week. 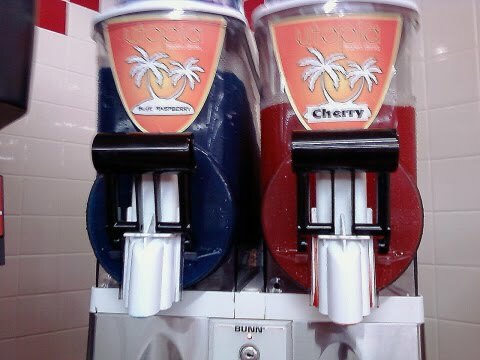 3) Juice – Offered as the “fruit” in many of the lunches I ate. Additionally juice boxes are a popular home lunch box item. I’m planning a post on juice boxes too…. 4) Sports drinks – Not available in elementary school, but are prevalent among student-athletes. 5) Soda? (pop?) – Banned in the majority of elementary schools and some high schools. Is it still offered in a lot of high schools? As a kid I ate the same kind of lunches that Mrs. Q posts on the blog, albeit on styrofoam trays. As an adult, I worked for a state university food service program for 3+ years until we were downsized. 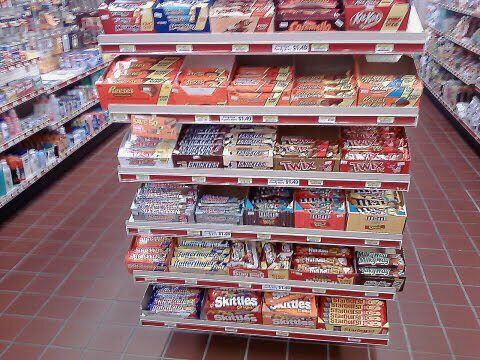 After being let go, I found work at a local convenience store as the night clerk. 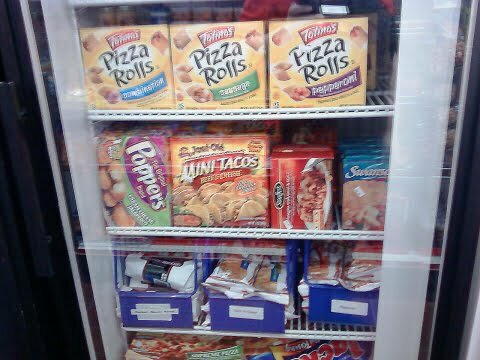 Between working in the food service program and the convenience store I see a clear picture of what our college kids are eating. Here’s a hint… it’s not pretty. In the food service program, I started at the same time as a new executive chef, who was, in fact, an awesome guy. He was very interested in increasing the quality of the food, i.e. fresh(er) ingredients, making food from scratch, etc. In the three years he worked with us the food was actually pretty decent. The kids still went nuts for the nachos and chicken nuggets, but at least we were making salsas from scratch (mmm, fresh cilantro! ), serving steamed veggies and spanakopita and the like. The chef, regrettably, moved on, and when our new chef was hired he was the “balance the budget” guy. I was the “grab and go” cook, and when the new chef came in, we eliminated half of the fresh stuff I was making right away. Freshly prepared lasagna was replaced by frozen “lasagna rolls” and freshly steam-baked chicken breasts for sandwiches were replaced by frozen, pre-cooked, pre-seasoned breasts (complete with fake grill marks!) Since we weren’t making so much food from scratch, he was able to cut 5 full-time jobs (of which mine was one) and replace us with a few part-time students. It was a win for the company, in eliminating the additional overhead of more workers plus benefits for the full time folks. But for folks like my boyfriend (a non-traditional student at the U) it was a loss. I recently met one of my former co-workers, a guy who had worked his way up from dishwasher to cook under the previous chef. Apparently they didn’t need him as a cook, either, so he’s been demoted down to a server at the cafeteria building. I can only imagine what they’re serving these days that requires 3 less full-time cooks (plus the other employees that lost their jobs) than it took a year ago to prepare decent food. My former coworker said that everyone wished the old chef would come back. 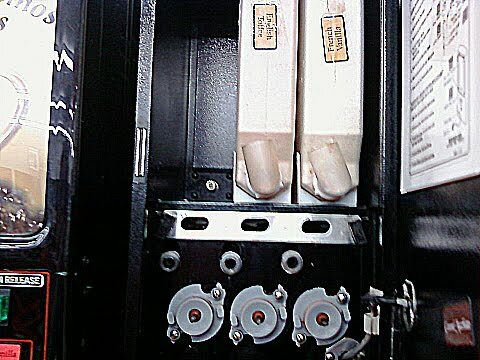 For drinkables we have the “cappuchino” mixes that are served from the machine… I hate cleaning this machine because the sugary instant coffee mixes get everywhere and everything gets gross and sticky. 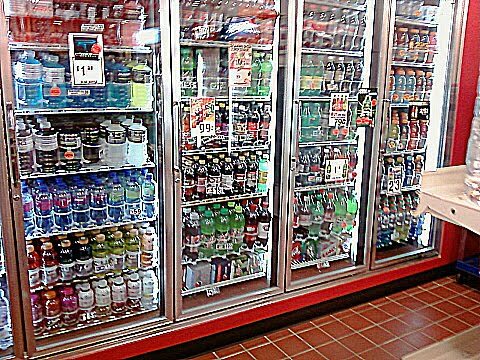 We also have flavored sugar waters, Gatorades, energy drinks, soda, slushees, sugared milk and beer, beer, beer. For slightly healthy beverages we have the plain coffee that’s actually ground from beans and brewed, unflavored (but expensive!) bottled water, a few types of tea (with plenty of sugar) and the lone row of V8 drinks. 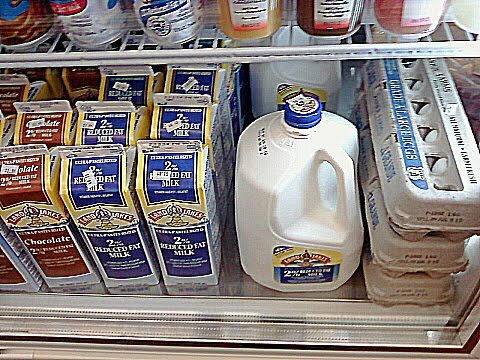 We also have plain milk, but it’s one of the more expensive items in the store. I make a ton of fried food and a bit of baked. I work the night shift so my focus is making edibles that drunks leaving the bars will enjoy. I make cheese balls, mini tacos, potato wedges, waffle fries, and onion petals, all deep-fried. For baked goods we serve chicken patty burgers, beef patty burgers, breaded beef burgers (it’s called a “pizza burger”), the same square pizza slices I used to eat in school, pre-fried egg rolls, and TWO varieties of corn dogs. 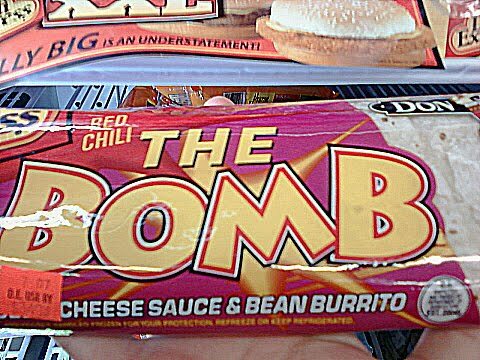 It’s pretty similar to what Mrs. Q and her students ate all year. 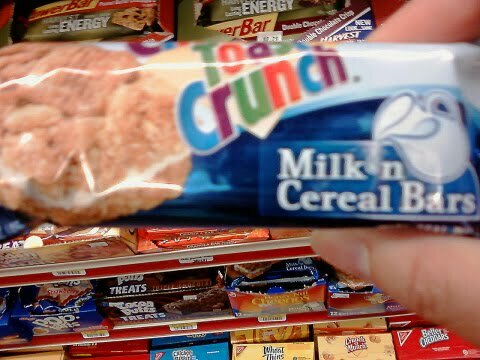 We have the pre-packaged cereal cups (and don’t forget your strawberry or chocolate milk, mmm…), a nacho machine complete with liquid cheese dispenser, chips, candy galore, frozen pizzas, Little Debbie cakes, giant cheesy prepackaged burritos, and prepackaged sandwiches of all varieties. 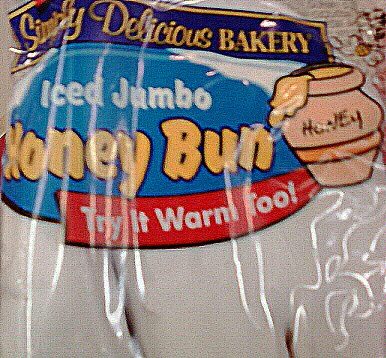 We have breakfast pizzas and burritos that I make around five in the morning, and a pre-fried breakfast taquito called a “Tornado.” I looked at one of the completely white, sugar coated “Honey Buns” the other day; it has 610 calories in one bun. 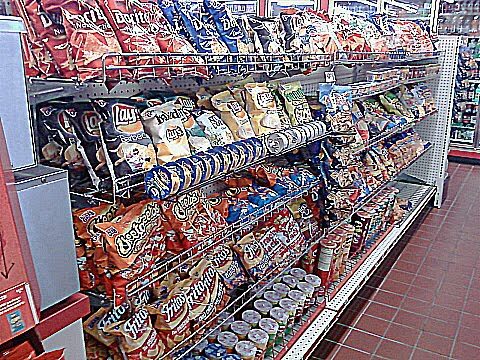 After the college kids eat their chicken nuggets and french fries in the college cafeteria, they come here and buy all the crap I’ve listed above. “Eating healthy” isn’t just about providing healthy food, it’s about changing attitudes and teaching people to CARE about what they feed their bodies. 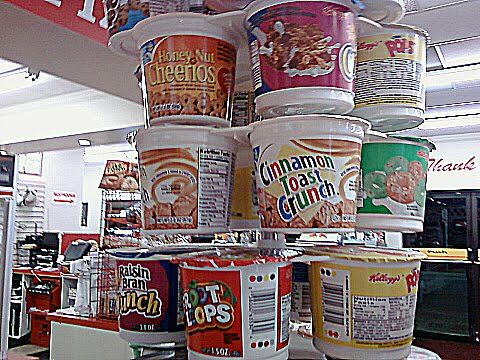 When Junior heads off to college and is on his own for the first time, he’s going to choose the same stuff he ate in the school cafeterias as a kid. He’s going to choose the same food that’s served at McRestaurants around the country. 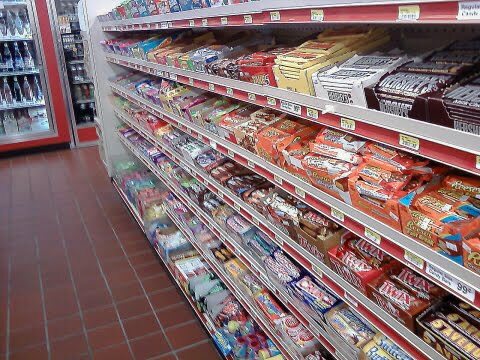 He’s going to choose the same food that his parents eat: the high-fat, high-sugar, deliciously deadly junk that infests this country as a whole. I have a next door neighbor that is a single mom with three kids, all under the age of 10. When I worked at a different gas station during the day, her kids would come in every day with her food stamp card and buy candy and soda. I can just picture her handing them her card and saying, “Go get a snack and get out of my hair.” This is the reality we live in, and unfortunately it’s a whole lot bigger than just the school lunches. Just putting a salad bar in the cafeteria doesn’t help (although for those already inclined to eat well, it’s a somewhat welcome refuge, despite the bacon bits, ranch dressing, oreo pudding, and peaches in syrup that regularly grace our university’s salad bar). My boss at the gas station is a health nut that doesn’t eat anything we serve here. But she has to answer to the bottom line, which means we sell what the kids and locals want to buy. Our store has five full-time workers and four part-timers whose lives all depend on our store doing well. And in order for us to do well, we sell beer, cigarettes, and junk. If we put in a salad bar, we’d end up throwing out a lot of produce and the waste and cost would drive us out of business. I guess in the end it’s not about simply changing what food we provide but really about changing attitudes. It’s about educating kids to care about food, to be enthusiastic about cooking and eating natural, healthy foods. 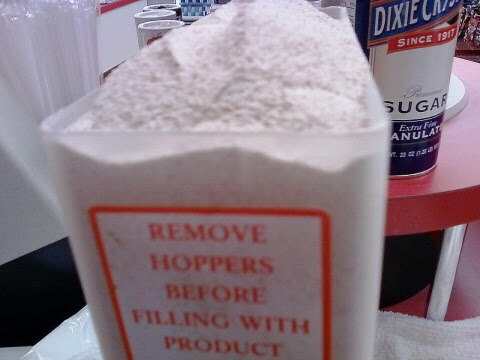 Ingredients: Sugar, nondairy creamer [corn syrup solids, partially hydrogenated coconut oil, sodium caseinate (a milk derivative), dipotassium phosphate, sodium tripolyphosphate, monoglycerides, datem, sodium silicoaluminate, artificial flavor]. Dairy product solids, maltodextrin, instant coffee, carboxymethyl cellulose gum, salt, artificial flavor, silicon dioxide (an anticaking agent), cocoa (processed with alkali), caffeine. As if you could read the ingredient list and then go on to blithely enjoy your corn syrup solids, sodium silicoaluminate and instant coffee. 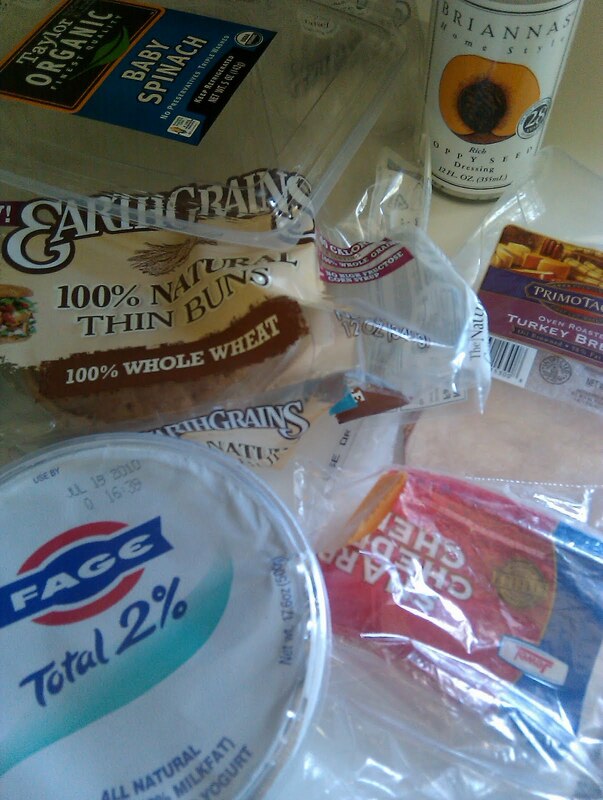 Many of you have wanted to know what I eat at home for lunch. Well, here’s a home lunch I had this week. 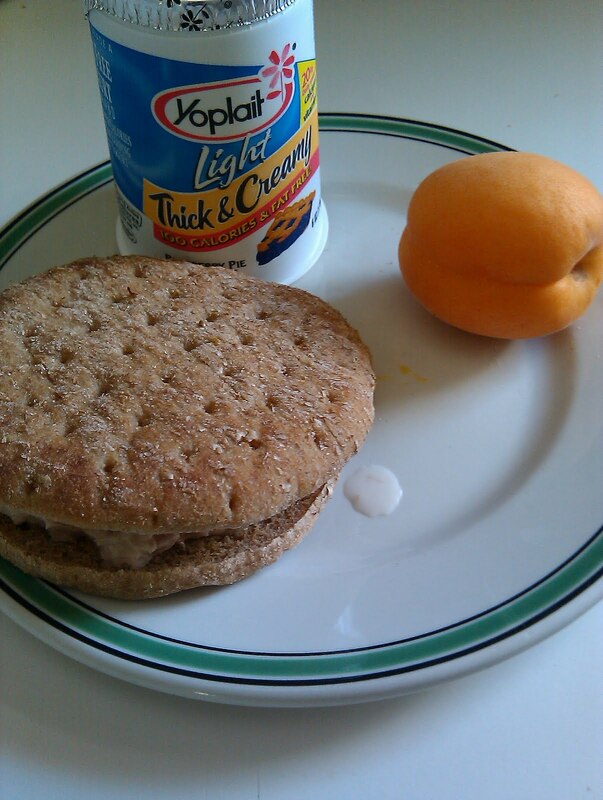 I love tuna melts (1/2 can chunk light tuna with real mayo, extra sharp cheddar, thin sandwich bread) and a yogurt, and an apricot. I’m not taking pictures of all of my lunches, but the occasional few… My husband laughed when I took a picture of the hospital breakfast the other morning and said, “Old habits die hard.” Too true. 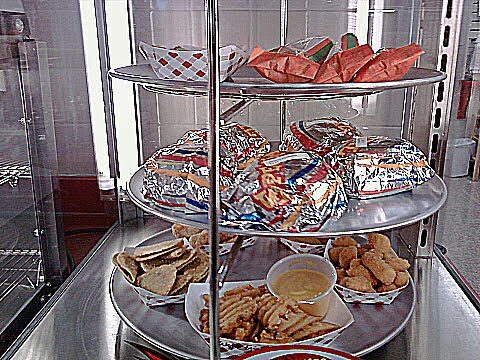 Anyone have any insight into why real sandwiches aren’t served at least as much as hamburgers, hot dogs, and chicken nuggets at school? Most of America is eating sandwiches for lunch. I consider them a staple. Am I wrong? Why does every school lunch seem to be hot? Can we eat the occasional cold sandwich at school? Yesterday I participated in an interview with Andy Bellatti. We’ve tweeted a lot (Twitter) and so we finally got a chance to chat. To listen to our discussion, visit his blog. I wish I could walk by a fruit stand every day. I used to live in a walkable neighborhood, but I don’t anymore. My husband and I walked to a health food store, the regular grocery, or just out to dinner. No car required. I miss it. My old walkable neighborhood did not have fresh fruit out on the street like this though. It’s so easy to snack healthily when you walk by fruit stands everywhere instead driving through Mc*Donalds’ drive-thrus. 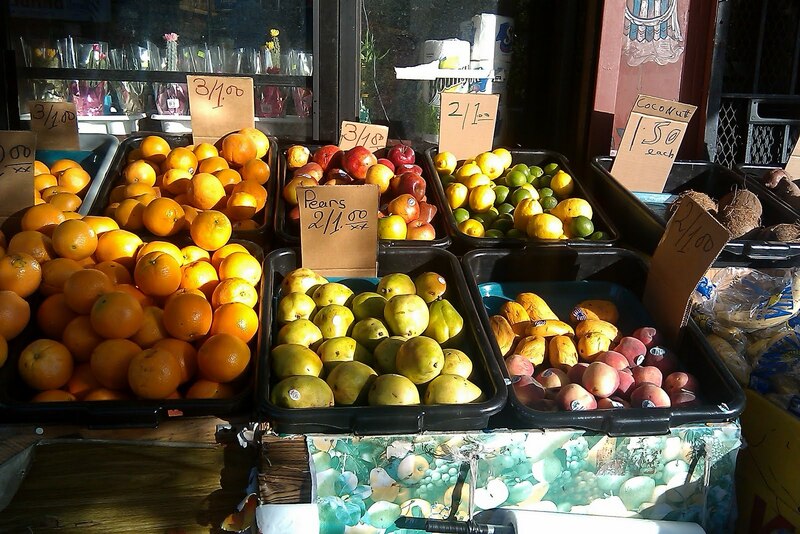 What happened to the neighborhood fruit stands? There isn’t money in it I guess. One commenter recently mentioned “fruit vending machines” and how prevalent there were in the 1970’s. We already have refrigerated vending (soda) — how hard would it be to obtain refrigerated fruit vending machines? It could be the “fruit stand of the future” (but really it has already been done). Like so many things in life, we need to go back in time.